Stephen Patrick, MD, MPH, MS, assistant professor of Pediatrics and Health Policy in the Division of Neonatology at Monroe Carell Jr. Children’s Hospital at Vanderbilt, testified before Congress recently about the rise and impact of drug withdrawal symptoms in newborns, also known as neonatal abstinence syndrome (NAS). The hearing was on the opioid crisis and its impact on children and families. 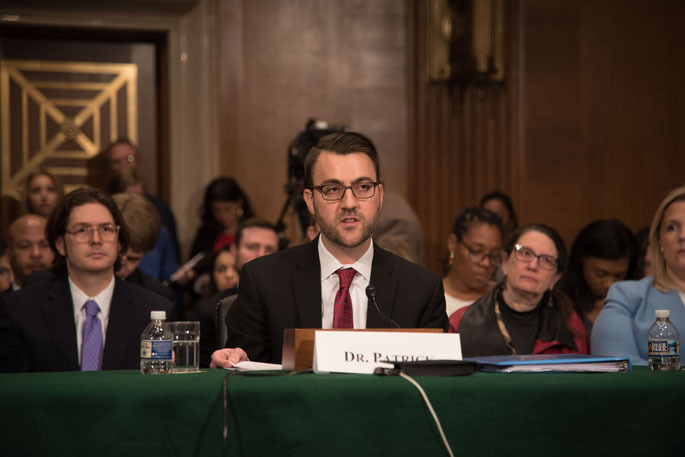 Patrick addressed the rising rates of NAS among infants and how additional action, funding and implementation efforts could help improve outcomes for pregnant women and infants impacted by the opioid epidemic. His full testimony can be read online at help.senate.gov/imo/- media/doc/Patrick.pdf. He spoke before the U.S. Senate Committee on Health, Education, Labor and Pensions, which is chaired by Sen. Lamar Alexander (R-TN).